Hi crochet lovers around the world! 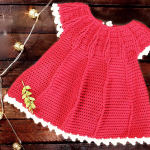 Today we have discovered very easy and cute baby dress video tutorial just for you. Dress your baby girl up for any special occasion. This dress is perfect outfit for birthday party, holiday or for photo shoots. You can choose any color you wish according to your taste. 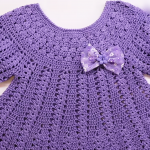 Make your baby girl beautiful and comfortable. The video tutorial will guide you step by step during your working process. This dress is also excellent gift for new or expectant mum. 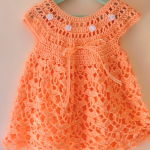 Any little girl, whether she is your daughter, granddaughter or friends daughter will look charming in this dress.